The Fidelis Cast Bronze Companion Cremation Urn is sized to hold the cremains of two adults. This cast bronze urn is raised on four legs, and is embellished with a hammered finish around the beveled top of the urn as well as around the base of the urn. The urn has a polished top and brushed sides. The urn is easily loaded through the bottom by removing a plate and screws. There is only one opening so cremains can be co-mingled in one plastic bag or placed in two separate plastic bags. As with any urn, but particularly with bottom-loading urns, it is important to keep the cremains in a sealed plastic bag inside the urn. This urn can be engraved on the top or the front for an additional fee. Please keep the engraving to no more than 4-5 lines (the more lines of engraving, the smaller the font size). 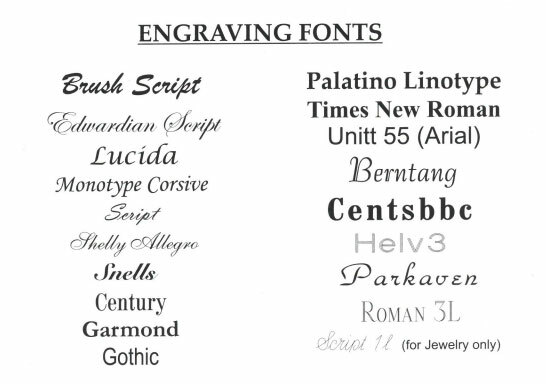 Engraving is limited to no more than about 50 spaces per line (including blank spaces between words). To select a font style, click on the tiny print below the large photo of the urn (next to the small photo of the urn). Write your font selection in the area provided under Options. The engraved text can be oxidized/blackened so that it stands out and is easy to read or it can be left unoxidized (not blackened) which is still readable but more subtle. The non-oxidized engraving may darken a bit over time. An engraving proof will be emailed for your approval prior to the urn being engraved. The urn usually engraves and ships one business day after the proof has been approved. Please call us if you have any questions regarding engraving. Holds 410 cubic inches which is adequate for two adults as long as both were under 6 ft tall and had a combined weight of less than 400 lbs when healthy (not when they passed). Please allow one business day after order is received before shipping. Ships from the Midwest.